In this sequel to VeVe's video "Mixed Judo: Tomoe Nage Lesson," VeVe faces the challenge of 30 minutes of continuous judo sparring, throwing, and submissions, all while being faced by 3 different male attackers. Exhausting! 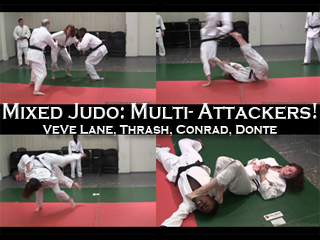 The video opens with VeVe judo sparring against another sensei (Thrash). After 5 minutes of throws and submissions, VeVe proves to be the stronger competitor. So, Thrash invites in two other senseis (Conrad and Donte) and thus the marathon begins! VeVe first takes on each man individually, the opponents fighting to throw and then submit each other. The men rotate through, giving each other plenty of time to rest between bouts, but VeVe gets no rest, facing a fresh opponent every time. At times, the men team up, attacking one right after the other, forcing VeVe to throw one and then immediately turn and throw the other. The men even score some throws and submissions as well, occasionally tossing VeVe with the Tomoe Nage. It's an incredible test of power and endurance for VeVe, as she performs throw after throw! In the end, VeVe outlasts her opponents and they admit they cannot continue. She then strikes a proud and accomplished victory pose over each opponent. Well earned with hard work! Throw Types: mostly Tomoe Nage (stomach throw), plus also foot trips, osoto gari, and hip throws. VeVe performs several armbars with feet on opponent's face, among other judo submissions.